The roof is your home’s main defence against the elements. It must withstand sunlight, rain, hard winds and, sometimes, heavy snow loads in our tough Nordic climate. For a roof that can stand up to these conditions year in and year out, you must choose the right right material. You also have to be assured that you can safely walk on your roof, for example, to remove snow, without causing damage that can impair its function or detract from its aesthetic appeal. In addition to functioning properly and protecting our home, we also want the roof to be attractive, even after we walk on it. Sheetmetal roofing, a traditional roofing material, has been used for over a century. Sheetmetal was first used as roof cladding in the 1800s, mainly on churches, castles and stately homes. Over the decades, both products and manufacturing methods have been developed and refined, and sheetmetal is now a strong and extremely wear-resistant roofing alternative that is made from recyclable material. Several techniques are used for manufacturing roofing sheet. 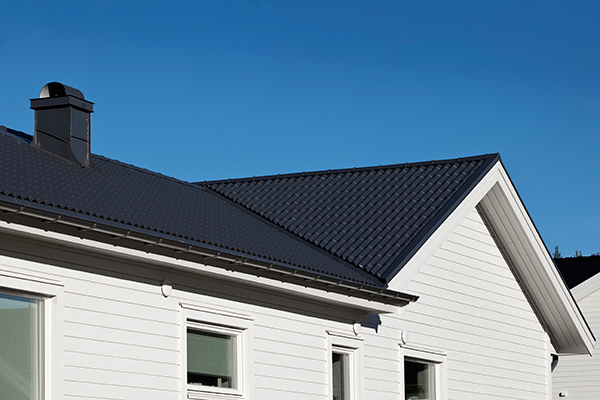 Kami’s unique press-forming technology makes the most of the steel’s material composition and gives your roof virtually unrivalled durability. Sheetmetal withstands wide temperature variations, rain and snow, and will protect you and your home for many years to come. Under the roofing sheet are battens, upon which the sheet rests and is affixed to. The battens rests on joists (depending on roof design), allowing air to circulate under the roofing sheet and evacuating any moisture. Kami’s Plegel steel sheet roofing can be installed with greater batten spacing than standard, while retaining equivalent or better durability than conventional tile-effect roofing sheet. Greater batten spacing means fewer battens and, thereby, better economy. The battens are affixed to a substrate that may consist of wood (tongue-and-groove) or more modern material. The decking should prevent any water under the roof cladding from penetrating the underlying structure. Roof decking or substrate can be built according to different principles. Examples include tongue-and-groove covered with tar paper and joists and battens, or a simplified under-roof with a diffusion-open or diffusion-tight walkable underlay. There are many variants and your roof structure determines the method that is most suitable for your roof. Accessories give the complete roof an attractive appearance. To give you a trouble-free, attractive roof Kami’s accessories are adapted for optimal function, appearance and fit. Most accessories feature our unique Terra and Plus surface coatings; therefore, they have the same appearance and properties as your roof cladding. Flexibility, one of our guiding principles, applies even here. There are few custom-made accessories that we cannot make. Please contact us if you have specific needs. As a property owner, you bear a responsibility. You are responsible for the safety of those who work on your roof. The chimney sweep, the antenna technician or the snow shoveller. This also applies to anyone on the ground near your house and under the eaves during the season when there is a risk for falling snow and ice. Safety requirements are outlined in national guidelines. Safety components may include roof ladders, roof bridges, platforms, safety line fixtures, snow guards and more. Kami also offers these products, so you can get everything you need for a complete roof from us.